Gordasm - It’s A Girl! Having gone waaay past her due date, it gives me tremendous pleasure to finally introduce you to Molly Virginia Fynes, born February 13, 2007 at 9:49pm. 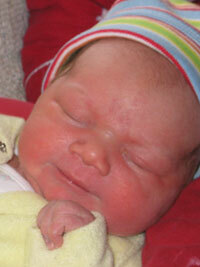 She weighed in at a whopping 8 pounds 15 ounces (1oz shy of nine pounds!). Laurel is my new superhero! Ms. Molly is doing most excellent, as is Mom, and her big brother no longer looks to her as being his nemesiter (I love that term). I’m sure that’ll change once she’s big enough to hold a game controller. The day before she arrived, I managed to put together a new tune using GarageBand and the m-Audio Oxygen keyboard. Please have a listen. Thank you to all that have visited, phoned, e-mailed and sent Cookiegrams™. We’re looking forward to getting her out of the house once the bitter cold weather lets up a bit and introducing her to the big, wide world. That, and picking up some groceries!